REGISTRATION IS NOW CLOSED. CLASS IS ALL FULL. Come and playfully learn the basics of a low tech and innovative painterly printmaking process called monotype. Monotypes are unique prints made by the direct transfer of an image. This easily accessible medium allows both novices and experienced artists of all ages to create finished images in relatively few steps. 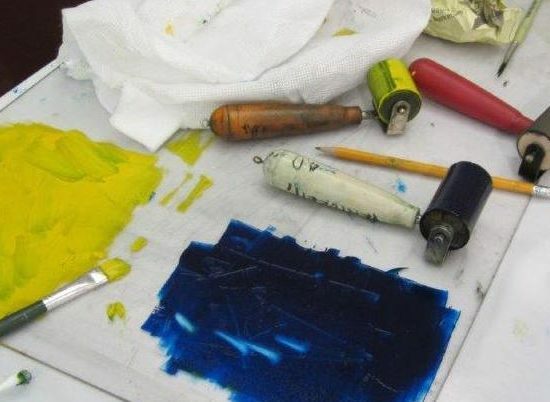 In this hands-on experience, workshop participants will develop an understanding of fundamental printmaking terms, materials, and inking techniques using oil-based inks with non-toxic cleanup. We will focus on both spontaneous and methodical approaches to the medium. Demonstrations will include the use of the etching press, printing by hand, and experimentation with textures and collage materials. In a relaxed atmosphere, with support and encouragement, you will realize your own personal artistic intent and expression of ideas and images.